The photo went viral after a magnificent and rare dome colored a red-hot bubble was caught on the camera 65 feet in the air. The active volcano Kilauea erupted a lava formed a dome fountain last October 11, 2019. 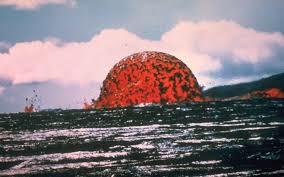 The dome came from Mauna Ulu, the same zone of the active and youngest volcano Kīlauea. Lava flowed fairly consistently lasted for 1,774 days from May 24, 1969 to July 22, 1974. This is the eruption to beat in at least 2200 years. The lava flows forms a dome is often too thick and sticky to flow very far, and thus instead pile up thick and high around the vent.